Here’s how it happened: Last June, Jenna Lyons – who is my friend as well as J. Crew president and creative director – wrote to me saying how much she loved my instagrams of life on our farm, and she wanted to know if J.Crew could shoot their autumn catalogue here. There would be lots of models, and she also hoped to casually include my family and me in a few shots. Sounded good to me. But then I got the dates. Zach and I would be in New York – I had a week full of publisher’s meetings lined up in the hope of selling my book, and Zach was signed up for camp. He had been looking forward to this time in our home city for months. I thought for just a minute and then decided I wouldn’t torture either one of us with a tough decision. We had made a commitment. We were going. I couldn’t imagine asking Zach to stay home for a photo shoot. So off we went. And what a time we had. But then the catalogue arrived and Zach saw Christopher and Coco on the cover and inside the book. “Hey how come we’re not in it?” he asked. When I explained that it was shot during our week in New York he said, “Oh yeah.” And went on his way. But he has asked me about it many more times. I guess he has to keep reminding himself how he missed out on this moment of glory. In any case, I was so happy and proud to see the farm in J.Crew. Christopher and Coco look so at home, and as usual Ginger managed to make her way into the pages. But in my mind the real stars of the shoot were the horses – Polo, Megan and Murphy – our beloved farm family members. Which brings me to a very sad note. Murphy, the cob that Coco is riding on the cover, died yesterday. In retrospect, I am so glad we cleaned him up and brushed his hair so beautifully for a glamorous fashion send off as a cover model. He so deserved it. When my tears dry up I will tell you more about him. There is no “look” my husband aspires to more than that of a farmer. Well, maybe a gentleman farmer. But for him it’s not an affectation. Both Christopher’s father and grandfather were gentleman farmers, and he was born and raised on the farm where we live. He wouldn’t ever look quite as polished as he does in these pics, but I’d say it’s close enough. Polo (seen above) was Coco’s pony until last year when she graduated to her first horse, and now I usually choose to ride him over my moody chesnut mare. Polo is pretty much a legend in this part of the countryside – he has been ridden and loved by many horse-loving girls throughout his 17 years of life at pony club, competitions and on the hunting field. Often when I am out riding, someone I don’t know will come up to me and say, “Is that Polo?” and then shower him with love. We are honoured to have him as part of our family. What other horse would just stand in an open field like that without running off. None that I know, other than Polo. By the way, did you know that a horse that is white in colour is always called a “grey” even if he is stark-white like Polo. At the moment, all I can see when I look at this picture is that kind gentleman of a horse Murphy in the background. I will miss him. This picture was taken on the gallops, where Christopher’s brother trains his race horses. Sometimes I’ll be in the stable yard, and I can hear them thundering up the hill. Our horses can hear it to, and the noise gets them all excited. An old Land Rover and a Subaru Forester are pretty much the cars that all farm owners have around here. This photo is very like my life on the farm – out by myself giving Polo a workout – except I would be sitting in a saddle and wearing riding clothes! Christopher and Coco do all the glamorous things with the horses, as they are much more accomplished than I am, so I’m pretty much the exercise jockey. This picture slayed Zach! He was so upset to be replaced by a model in his absence, especially in a pic with his Daddy. This is my favourite fashion pic from the style guide. I love her look. And I love seeing Polo’s well-worn saddle. I am sad I missed this part of the summer on the farm, when everything looks bleached out. The variety of seasons here is incredible – much more diverse and varied than back home in New York. Each season seems to have multiple phases that look very different from one another. The changing landscape is what keeps me from losing my mind in the wet foggy gloom. This picture didn’t make it into the style guide, but of course it is my favourite. Jenna sent it to me in a beautiful vintage silver and glass frame as a gift. As if everything else wasn’t enough. Love that girl. Its been so fun to see JCrew open in London. This catalog just made it feel so right. And your post provided great footnotes. How sweet is Jenna!? these photos are everything. 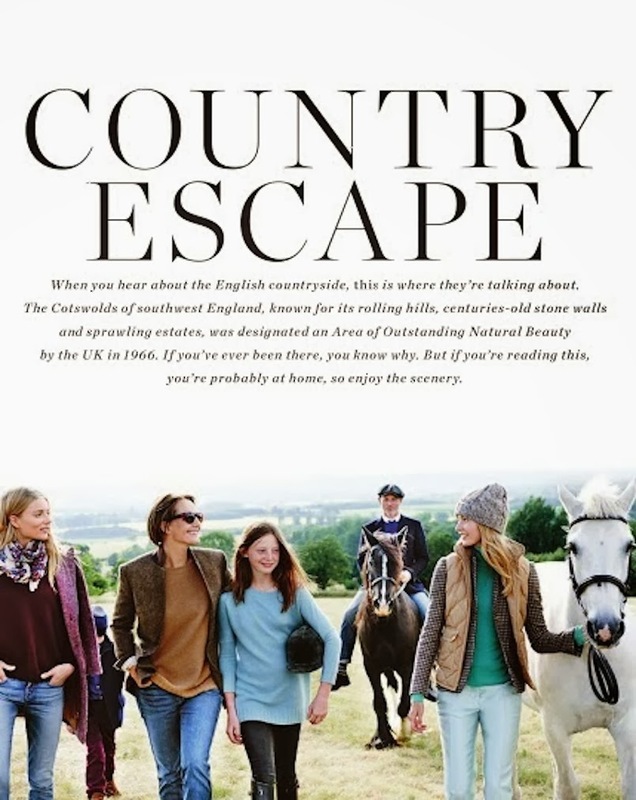 Coming from california, the presence of jcrew in the UK and the sprawling countryside is eye candy. Is this area close to the University? love i! So sorry about Murphy. What beautiful photos of your farm and family! Would love to have a November catalog! I am a reader of your blog and recognized your family the minute I saw the catalog. What fun for you all! What a thoughtful gift and great memories! Coco makes a beautiful model! What a great memory for her to have experienced something so unique.